In an area where little’s been done for many years to smarten up the streets, these lizard stencils popped up a week or so ago. There was one behind Charlton House, and one on a wall in Victoria Way. And one about to go for a drink at the Charlton Liberal Club (if it hadn’t closed last year). They were washed away by rain last Monday, all except one – at the bus stop at the top of Victoria Way. There were some mutterings that they may have been gang symbols – but the locations would seem to count against that. Hopefully, they were put there by someone who wanted to brighten up the area. Or even just for a laugh. In an area where the public realm is tatty and civic pride is lacking, they caught the eye. Will the lizards return? We wait and see. One of south London’s most distinctive – and best-loved – graffiti artists has left his latest calling card in a overlooked corner of Charlton. 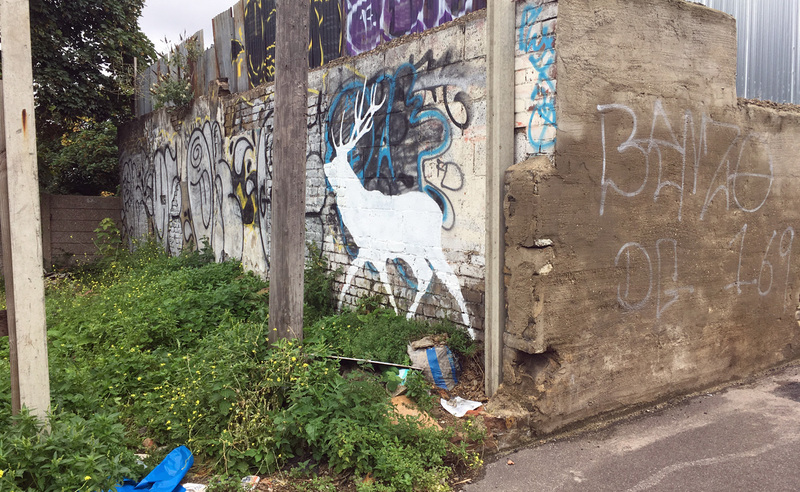 The Lewisham Natureman’s white stags – often adorned with that borough’s crown logo – have been spotted in locations including the River Quaggy in Lee, wasteland in New Cross, the old Catford dog track and underneath a railway bridge in Lewisham. Possibly the most visible one is on a gate at Greyladies Gardens, a block of flats on the Lewisham flank of Blackheath. The Lewisham Natureman is a legend thought to have its roots in South East London’s local graffiti scene. He has never been seen and is only represented by a small carving, that can be found [normally hidden] in the wastelands, train sidings and rivers of the borough. This has given way to the belief that this character is not human at all but actually a spirit of the wild; an urban incarnation of the Green Man or Cernunnos; the stag lord. It’s been a while since one of the stags have appeared – but now one has emerged in Bramshot Avenue, Charlton, on a wall next to land which until recently hosted a large advertising hoarding. It’s not the Lewisham Natureman’s first appearance in Greenwich borough – one was spotted outside the former Thomas Tallis School in Kidbrooke two years ago. 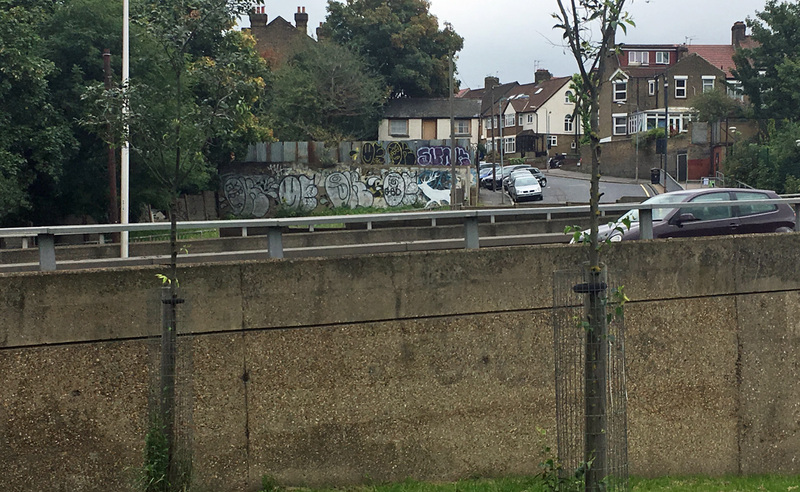 Long-standing residents may remember horses grazing on this land until the 1980s – the Natureman’s reappearance may help jog some memories, as well as giving travellers stuck on the Blackwall Tunnel approach something to gaze at.